Offer your patients the permanent hair reduction solution they desire with LightSheer® DESIRE™ Light. By using our hair removal lasers your patients will enjoy a treatment that is effective and comfortable, using 805nm diode laser with advanced ChillTip technology. Grow your business by providing your patients laser hair removal treatments and benefit from rapid return on investment. Leg Veins – Approximately 50% to 60% of men and women have unsightly leg veins. While sclerotherapy is still considered the treatment of choice for the removal of superficial leg veins, many vessels may be too small to inject or patients may have an aversion to this invasive procedure. The LightSheer diode laser system can provide an alternative method of treatment that requires no painful injections. 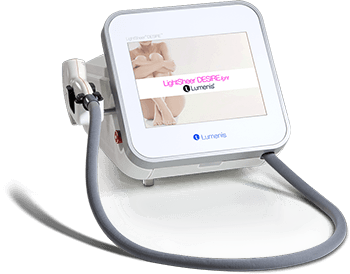 Benign Pigmented Lesions – The LightSheer diode laser system can successfully treat a wide range of cosmetically undesirable benign pigmented lesions. Pseudofolliculitis Barbae (PFB) – PFB, or razor bumps, is a common condition in which the regrowing hair, after shaving, curves back towards and pierces the skin resulting in a pustule or papule. PFB is very prevalent in populations with curly hair, affecting nearly 85% of men of African descent and a growing number of women. The LightSheer’s excellent safety profile for all skin types including the darkest skin, makes it a safe, effective and revolutionary alternative for the treatment of pseudofolliculitis Barbae.